N-Power is one of the programme initiated by the federal government to enhance job creation and empowerment. It is an initiative of the National Social Investment Programme(NSIP) of the Federal Government of Nigeria. It is dedicated to the training and certification of unemployed Nigerian Youths aimed at building highly competent and skilled workforce of technicians, artisans and service professionals. Components: (7) Automobile, Agric. Tech., Carpentry & Joinery Electrical Installation, Hospitality, Masonry & Tiling, Plumbing & Pipefitting. Documents Required: Valid ID Card, Birth Certificate, Proof of Address of residence, BVN. Graduating trainees would earn an exit tool box/Starter Kit at the completion of their in- centre training. We realise that many have been waiting on information on the N-Power Build. We apologize. Please note that the portal will NOW open within a few weeks. N- Power Beneficiaries across Nigeria will get the opportunity to win some money. Stay tuned to our channels for details. 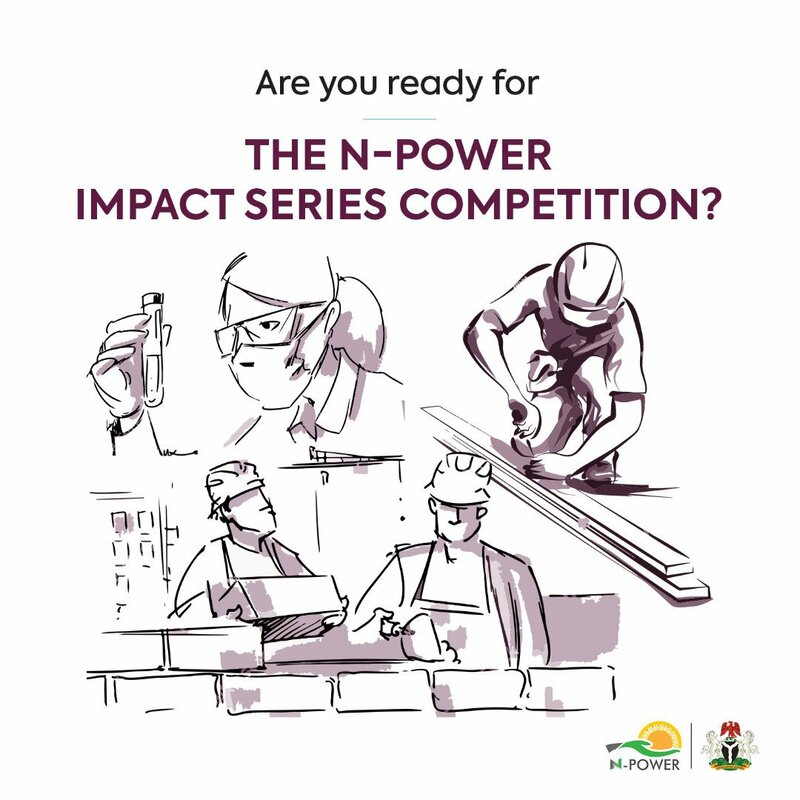 In the N-Power Impact Series Competition, 1 Beneficiary in each state has the opportunity to win 1 Million Naira. All you have to do is upload a video talking about how N-Power has impacted your life and your community. NPower will be expanded to accommodate 1 million beneficiaries in the next phase, Vice-President, Prof. Yemi Osinbajo says. He said this in a statement by his Senior Special Assistant on Media and Publicity, Office of the Vice-President, Mr Laolu Akande in Abuja on Tuesday. “The idea of N-Power is supposed to be government own programme of direct employment and training. “At the moment, we have taken up to 500,000 and in the next phase, we are looking at another 200,000 and closely followed by another 300,000. He said the Federal Government was working on creating the enabling environment to ensure that beneficiaries as well as other unemployed Nigerians become useful to themselves. For your backlogs, email us at volunteersupport@npvn.ng including all supporting documents to prove you worked for these months of alleged unpaid stipends. For your device status, send a mail to distributionsupport@npvn.ng. Senior Special Assistant to President Muhammadu Buhari on Job Creation and Youth Employment and the National Coordinator of the Federal Government Social Investment Programme, N-Power, Mr. Afolabi Imoukhuede, announced this on Saturday at Edo state. Candidates qualified for ‘N- Power-Enhance’ are Batch A beneficiaries. He disclosed this at the N-Power Edo South programme, with the theme “Build the Future” held in Benin City, Edo State.